The new Shell city-car concept is a bit like the younger cousin you don’t see often—cute and kind of weird, but intriguing at the same time. The car, which has the ability to get up to 107 miles per gallon, comes by the efforts of an odd combination—an oil company and the designer of the McLaren F1 car. 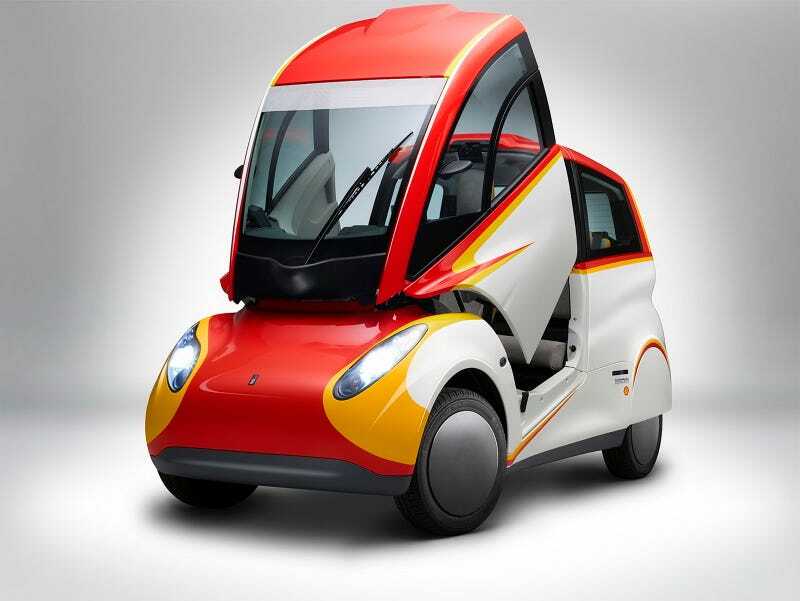 The project has been three years in the making by Shell and designer Gordon Murray, and it remains a concept car for now. Its numbers scream “concept,” though, as the car averages 89 miles per gallon and it weighs a mere 1,200 pounds. This certainly isn’t Gordon’s fastest car, as its three-cylinder engine has 43 horsepower and its zero to 62 mph is a cute 15.8 seconds. Speeds and horsepower on this car don’t rival Murray’s Formula One design work, but there actually is a similarity or two between the concept and an F1 racer. The vehicle seats three, with the driver positioned in the center on the front row of the car and room for two passengers in the second. The roof of also pops open so that passengers may climb in and out, as seen in the photos above and to the left. Despite his history with faster vehicles, this isn’t Murray’s first attempt at a tiny car. He’s actually had a lot of practice in the area. Murray based the Shell car on the designs of his T.25 and T.27 city cars, of which the T.25 went into limited production. Shell’s part in creating the car came by providing lubricants, and those along with drivetrain adjustments allowed this tiny car to be more efficient than Murray’s last. The Shell car is just a concept for now, and CNET reports there are no manufacturing plans to go along with it. If these cars were out on the road, they’d be a good fit for all of the emissions drama of recent history—despite not being electric like many new-wave concepts, claims are that these cars would produce 34 percent fewer emissions than other tiny city cars. They’re also made mostly of recycled (and recyclable) carbon fiber. It’s a shame that there are no plans for production. With the color scheme, it’d be a really cute vehicle to deliver fast food in. Loading would be easy, too. Plus, drivers would never have to defend their territory from those annoying shotgun passengers when using the radio again.